I recently attended the North American Christian Convention that was held in Kansas City. There I ran into David, an old friend of mine. David is about 6’ 5”, so he stands out in a crowd. I am just a shade under 6’, so David seemed to tower over me as we talked. Tall like us!? I wasn’t feeling very tall at all, but David was graciously including me among the tall people of the world. He made me feel good about myself. Too many people are quick to drag others down. It is much more encouraging to lift them up! 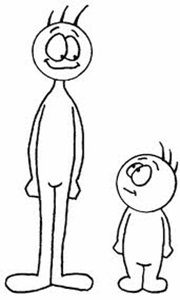 Let’s do all we can to make people feel like they are “tall like us”. “Do not let any unwholesome talk come out of your mouths, but only what is helpful for building others up according to their needs, that it may benefit those who listen.”—Ephesians 4:29. This entry was posted in Christian Living, Leadership and tagged edifiying speech, encouragement, Ephesians 4:29, lifting others up, North American Christian Convention, short people, tall people. Bookmark the permalink. Reblogged this on Aills Christian Church.